I use different types of sketchbooks. I prefer the hardbound cover but I also have the spiral bound sketchbooks. They also come in either toned tan paper or white. I find myself sketching a lot more and I wished started doing more of it earlier in my life. Most of the early sketchbooks were used for sketching design ideas but now they’re mostly used for sketching people and other types of subjects from life. 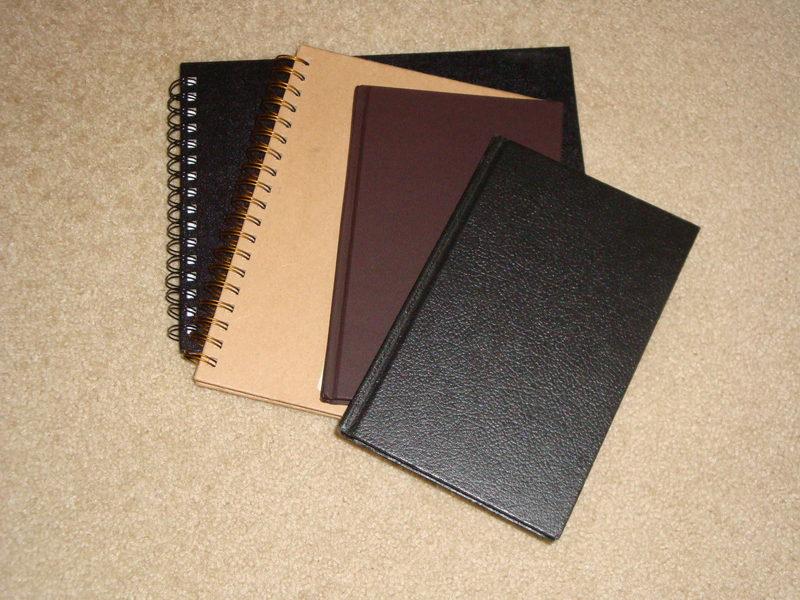 From left to right the larger black spiral sketchbook is a Picadilly, the next one on top of it is a Cachet by Daler-Rowney recycled toned paper sketchbook, the brown hardcover toned paper sketchbook is a Strathmore, and the black hardcover is a Canson. There are many brands available and I’ll sometimes get whatever I can get my hands on. The main drawing/sketching tool I’ve used for these sketchbooks is the ball point pen. I’ve also used graphite pencil but only rarely.